Wendy Etherington was born and raised in the deep South—and she has the fried chicken recipes to prove it. The author of nearly twenty books, she lives in South Carolina with her family and an enthusiastic Shih Tzu named Cody. Hey, all! Sorry I've been lax in updating. Deadlines always seem to be looming. I did take time recently to revamp my website, though. It had gotten too big and busy looking. Hopefully, you'll like the simpler look. I'm going to Charlotte this week for several NASCAR events, so I'll be sure to take some pictures and give you updates on all the fun. It's the 50th anniversary of the Coke 600, so there should be plenty to talk about. Hey, all! Head over to www.freshfiction.com today and check out who their Fresh Pick of the day is! This is a fun, informative website run by some great Texas gals who are wildly supportive of romance authors. Be sure to visit them often! Congrats to Joy from Arizona for winning my annual holiday contest! Joy will be receiving a big basket of books, chocolate and candy to keep her warm and happy all through the holiday season. Thanks to everyone who entered! Oh, and I have pictures of NASCAR Champion's Week--somewhere at least--I'll try to get them posted in the next week or two, so you can see all the fun Liz and I had in NYC. Hey, all! I've been typing my little fingers to the bone lately, but I'm taking a break today to update the blog (and the website). A couple of weeks ago I actually did something really cool (besides sit in front of my laptop!). I went to the Richard Childress Racing Museum and did an interview with Sirius NASCAR Radio (channel 128 for those of you who have satellite radio). 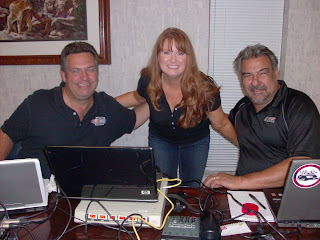 I was a guest on the show Tradin' Paint with hosts Steve Post and Chocolate Myers. Steve is a long-time pit reporter for MRN and hosts several shows on Sirius. Chocolate was a member of the legendary "Flying Aces" for Dale Earnhardt, serving as his fuel man and vital member of the pit crew that won so many NASCAR championships. We talked about books and racing--and books involving racing. It was great fun, and the folks at Sirius were incredibly kind, professional and supportive of Harlequin's efforts with tackling a fictional NASCAR world. Chocolate has actually inspired one of the characters for the last book in mine & Liz's trilogy, which he seemed pleased and surprised to hear about. (The guys have been teasing him, calling him "Hot" Chocolate now.) We all had a great time, and I hope to visit with the guys again soon. Also, my website has the new contest posted--The 4th Annual Holiday Contest, in fact. And, yes, I know it's too early to be talking about the holidays, but I wanted to give everybody a couple of months to get their entries in. Good luck, and I hope things will slow down some, so I can post more often. Liz and I are hoping to announce some exciting news for upcoming events and projects soon. They will each receive a signed copy of Risking Her Heart. Congrats and thanks to all who entered! Just wanted to pop in for a second to announce the winners of my Hot Pursuit Contest--Leslie from Georgia and Linda from Kentucky. They'll each receive a signed copy of the book. The new contest is posted on my website. Be sure to enter fast, since the deadline is September 30th. I'm giving away five copies of mine and Liz's October release, Risking Her Heart. Go to my website www.wendyetherington.com and enter today! Remember Hot Pursuit is on the shelves now. Get a copy and let me know what you think. Just wanted to announce that Cody and I have drawn for the Summer Reading Contest and are pleased to announce that Teresa from Arkansas has won! Teresa will receive a bag of books and summer goodies during these long, hot days. Visit my website to enter the new contest. The prize is an advance copy of my September release, Hot Pursuit.